All Winona Gallop dreamed of was a safe place for her children to ride their bikes. The year was 1970 and Gallop and her family lived in the Beach where cyclists were barred from cycling in the lakeshore park or using the wooden boardwalk. And if anyone had thoughts of ignoring that edict a motorcycle-riding park warden patrolled the area. The following year a small bulldozer arrived in the Beach and carved a roughly two kilometer shallow trench from the grass. Loose stone was laid on top and in 1974 the path was paved. Gallop, however, wasn’t satisfied and pushed to extend the route west along the shores of Lake Ontario. Three years later, she convinced Metro government, Toronto Parks and the Toronto Harbour Commission to allow several University of Toronto students to break wilderness, survey industrial ruin and mark out a useable trail through Toronto’s port lands. She funded the work with a community grant. By 1978 Toronto residents had a bike path running from Cherry Street to the eastern most end of the Beach. Winona Gallop spent eight years working out logistics, chasing down politicians and raising public support and money to complete her vision. She was, in turn, designer, lobbyist, surveyor, banker and builder. 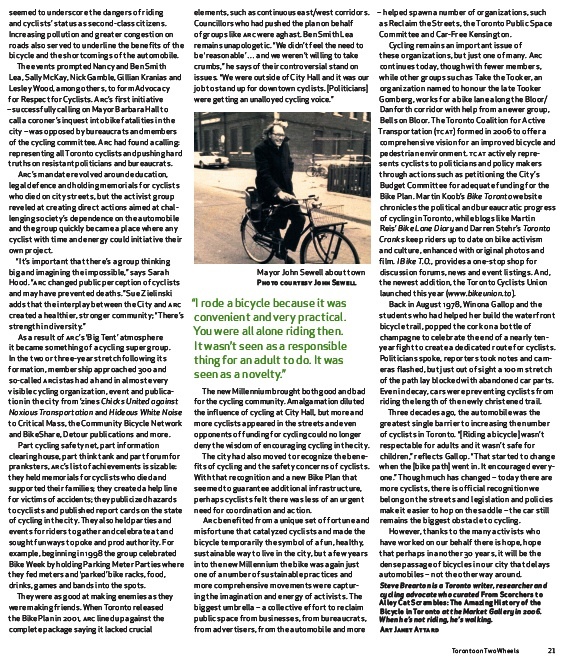 Gallop is the prototypical Toronto cycling activist: a determined dreamer who remains largely unknown and unrecognized. At the 11th hour the cash-strapped city effectively sold the naming rights to Gallop’s bikeway to the Toronto Star to pay for the paving and then duly christened it the Martin Goodman Trail after a recently deceased Toronto Star editor. Gallop is among a group of committed activists who helped build everything from bicycle lanes to bicycle culture in the city. 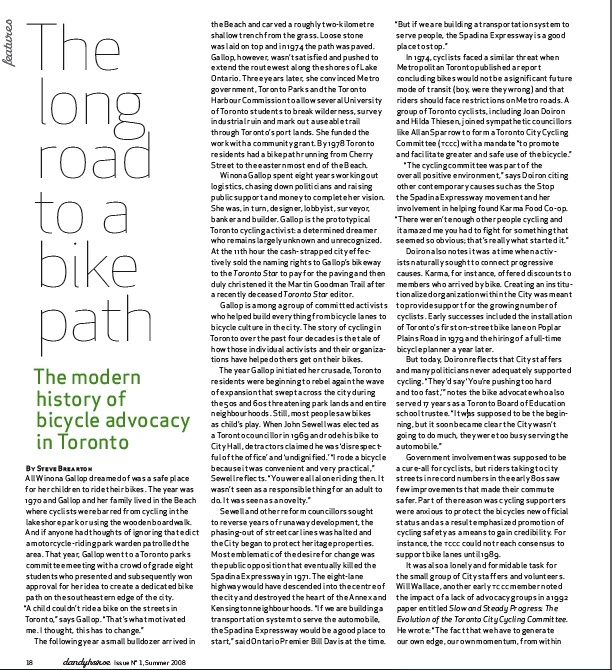 The story of cycling in Toronto over the past four decades is the tale of how those individual activists and their organizations have helped others get on their bikes. Doiron also notes it was a time when activists naturally sought to connect progressive causes. Karma, for instance, offered discounts to members who arrived by bike. Creating an institutionalized organization within the City was meant to provide support for the growing number of cyclists. Early successes included the installation of Toronto’s first on-street bike lane on Poplar Plains Road in 1979 and the hiring of a full-time bicycle planner a year later. Government involvement was supposed to be a cure-all for cyclists, but riders taking to city streets in record numbers in the early 80s saw few improvements that made their commute safer. Part of the reason was cycling supporters were anxious to protect the bicycle’s new official status and, as a result, emphasized promotion of cycling safety as a means to gain credibility. For instance, the TCCC did not reach consensus to support bike lanes until 1989. Hansen helped raise issues – the environment, sustainability, health and safety – offered solutions and used language that later activists would mimic to promote cycling. She subsequently founded Bikes Not Cars, a lobbying organization dedicated to reducing automobile use and promoting the bicycle. Hansen, in her prescient way, realized the automobile was the greatest obstacle to the growth of cycling in the city. In the meanwhile, the City of Toronto’s initiatives were slowly serving more and more cyclists. Bike to Work Week was attracting hundreds of commuters to pancake breakfasts, while The City Cyclist, now called Cyclometer, a newsletter for cyclists, could boast circulations up to 5,000. And perhaps more importantly, cyclists began to emerge as a distinct community that deserved support and respect. If previous bicycle boosters had viewed cycling as a single spoke in a large progressive wheel, individuals like Jack Layton, Olivia Chow and Dan Leckie saw cycling as an important movement by itself and understood that bringing the disparate community together was the best way to gain power and improvements. It was the mid-80s when Sue Zielinski, today managing director of the University of Michigan’s sustainable mobility & accessibility research & transformation program, attended her first meeting of the cycling committee and, following a short conversation with Layton, suddenly found herself editing the TCCC’s City Cyclist newsletter. Following Layton’s 1982 election he chose to co-chair the TCCC and worked to energize and focus the committee, according to Wallace. He and his political partners were crucial in keeping cycling on Council’s agenda and ensured money was available for staff and infrastructure. They initiated important events such as the Cycling and the Law Conference, in 1985. That meeting helped frame cycling in a positive light for bureaucrats and legislators and encouraged cycling-friendly changes to Ontario’s Highway Traffic Act. In 1987, a group including Tony Boston, Sue Zielinski, Steve Beiko, Kate Sutherland, Phil Piltch and others formed Cycle Watch to offer support to cyclists. Adrienne Boston, Tony’s wife, had died the previous year after being hit from behind while riding her bike and the group was created, in part, to address the lack of information available for cyclists involved in collisions. Cycle Watch founders were also struck by the indifference with which the death of a cyclist was met in the city –by the police, by the courts and by the public – and were determined to change that. With expertise ranging from law to transportation planning, the group printed “clip n’ carry” accident forms for cyclists, ran a telephone hot-line offering advice and referrals to lawyers and collected statistics. “People were passionate and committed,” says Sutherland. “The fact we were giving and serving together stands out for me. And those things were inextricable.” Cycle Watch also worked behind the scenes with the City by lobbying to have tire-eating sewer grates replaced, and with the province by advocating for safer traffic standards. Cycle Watch, like a host of cycling organizations before and after, benefited from the financial and organizational support of the City of Toronto. And no staffer was more important than Sue Zielinski, who, when hired as the City’s cycling commuter coordinator in 1991, became a one-woman mid-wife to the nascent community. If Jack Layton had understood the possibilities of consolidating cyclists, than Zielinski helped bring cohesion to the chaos. “Sue was really the only [staffer] using her job to do what she would have done anyway,” says Sarah Hood, a Toronto writer who helped animate many of the city’s first cycling organizations. 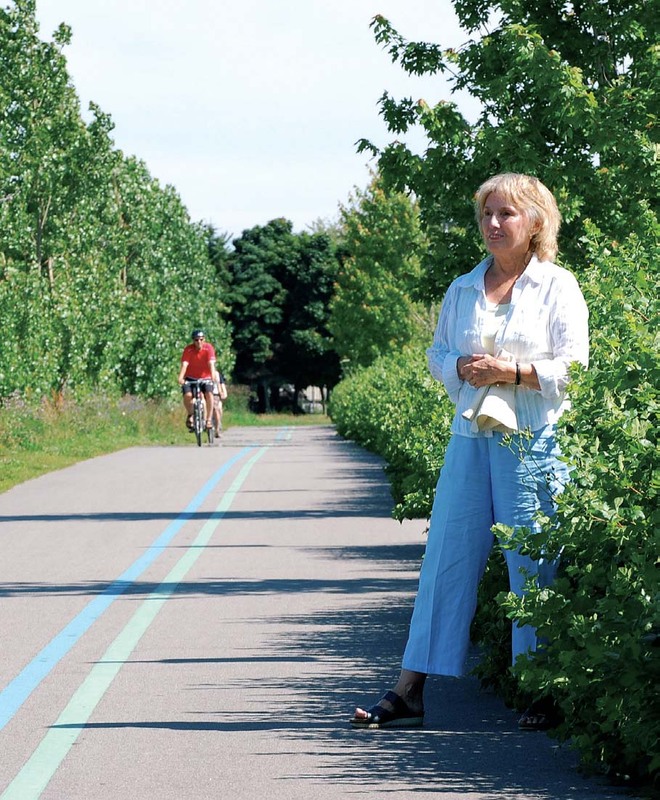 “She would think of types of organizations that were needed and find people and funding to start them.” Zielinski was crucial in supporting cycle projects from Toronto’s Bike Choir and Transportation Options to Detour Publications and Community Bicycle Network. “If the city hadn’t made cycling a budget item we wouldn’t have a cycling community. Period,” adds Hood. The hunger for connection was further demonstrated in 1994, when Peter Kraiker turned to the Internet to create a bulletin board for cyclists. One Less Car was primitive by today’s standards – logging in initially required the use of a modem to dial a Toronto telephone number – but once hooked in visitors had access to information and forums ranging from full text of Cyclometer, to advice on bike repair and discussion groups on bike theft and bike lanes. Kraiker’s site, which boasted over 750 regular users at its peak, was comprehensive and predated similar sites by almost a decade. fell short, many members were left feeling angry with bureaucrats. While the City was outwardly keen to promote cycling there was also an unspoken understanding that it could not be done by criticizing or questioning the ascendancy of the automobile. This would become a key point of contention for activists “it was extremely frustrating,” says Nancy Smith Lea, commenting on the Spadina fiasco. “There was a feeling you couldn’t get anything done at City Hall.” The Smith Leas and other activists would soon start another cycling group to tackle that problem head on. Sarah Hood attended the first 60 rides to distribute a bookmark-sized flyer to educate drivers and pedestrians about Mass. The flyer included a calendar of cycling events. Hood, ever present on her tiny orange fixed-gear bike, chronicled cycling in the city and played a crucial role in bringing disparate parts of the movement together. She took the time to talk to newcomers at Mass and other events in order to steer them to organizations where they could contribute. Through the 80s and early 90s, Toronto messengers held an iconic place among cyclists for their high visibility, unique style and we-belong-on-these- streets attitude. They were the city’s first cycling ambassadors – even if their style was decidedly undiplomatic. Alley Cat Scrambles, unsanctioned night races first organized by John Englar, Leo Slonetsky and Lance Lattrulo in 1989, were not strictly messenger races, but regular Valentine and Halloween races subsequently run by Englar were epitomized by courier style and bravado and were the closest thing to regular celebrations Toronto’s urban cyclists had. Couriers became even more closely identified with bicycle culture when Derek Chadbourne and Nic Thomson brought the Cycle Messenger World Championships to Toronto in August 1995. The week-long event featured terrific racing, naked riders on bar crawls (as well as the city’s first clothes-free ride) and an overdose of bike culture that showed recreational and commuter cyclists where the rubber really met the road. If 1995 seemed like a party for bicyclists, then 1996 must have been the hangover. During a two-week stretch in July 1996, two people died while riding bicycles in Toronto and two others were arrested during a Critical Mass ride. Cycling was booming in the city, but the deaths and the arrests seemed to underscore the dangers of riding and cyclists’ status as second-class citizens. Increasing pollution and greater congestion on roads also served to underline the benefits of the bicycle and the shortcomings of the automobile. The events prompted Nancy and Ben Smith Lea, Sally McKay, Nick Gamble, Gillian Kranias and Lesley Wood, among others, to form Advocacy for Respect for Cyclists (ARC). ARC’s first initiative – successfully calling on Mayor Barbara Hall to call a coroner’s inquest into bike fatalities in the city – was opposed by bureaucrats and members of the cycling committee. Arc had found a calling: representing all Toronto cyclists and pushing hard truths on resistant politicians and bureaucrats. ARC’s mandate revolved around education, legal defence and holding memorials for cyclists who died on city streets, but the activist group reveled at creating direct actions aimed at challenging society’s dependence on the automobile and the group quickly became a place where any cyclist with time and energy could initiative their own project. As a result of ARC’s ‘Big Tent’ atmosphere it became something of a cycling super group. In the two or three-year stretch following its formation, membership approached 300 and so-called ARCistas had a hand in almost every visible cycling organization, event and publication in the city from ’zines Chicks United against Noxious Transportation and Hideous White Noise to Critical Mass, the Community Bicycle Network and BikeShare, Detour publications and more. Part cycling safety net, part information clearing house, part think tank and part forum for pranksters, ARC’s list of achievements is sizable: they held memorials for cyclists who died and supported their families; they created a help line for victims of accidents; they publicized hazards to cyclists and published report cards on the state of cycling in the city. They also held parties and events for riders to gather and celebrate at and sought fun ways to poke and prod authority. For example, beginning in 1998 the group celebrated Bike Week by holding Parking Meter Parties where they fed meters and ‘parked’ bike racks, food, drinks, games and bands into the spots. The new Millennium brought both good and bad for the cycling community. Amalgamation diluted the influence of cycling at City Hall, but more and more cyclists appeared in the streets and even opponents of funding for cycling could no longer deny the wisdom of encouraging cycling in the city. The city had also moved to recognize the benefits of cycling and the safety concerns of cyclists. With that recognition and a new Bike Plan that seemed to guarantee additional infrastructure, perhaps cyclists felt there was less of an urgent need for coordination and action. ARC benefited from a unique set of fortune and misfortune that catalyzed cyclists and made the bicycle temporarily the symbol of a fun, healthy, sustainable way to live in the city, but a few years into the new Millennium the bike was again just one of a number of sustainable practices and more comprehensive movements were capturing the imagination and energy of activists. The biggest umbrella – a collective effort to reclaim public space from businesses, from bureaucrats, from advertisers, from the automobile and more – helped spawn a number of organizations, such as Reclaim the Streets, the Toronto Public Space Committee and Car-Free Kensington. Cycling remains an important issue of these organizations, but just one of many. ARC continues today, though with fewer members, while other groups such as Take the Tooker, an organization named to honour the late Tooker Gomberg, works for a bike lane along the Bloor/Danforth corridor with help from a newer group, Bells on Bloor. The Toronto Coalition for Active Transportation (TCAT) formed in 2006 to offer a comprehensive vision for an improved bicycle and pedestrian environment. TCAT actively represents cyclists to politicians and policy makers through actions such as petitioning the City’s Budget Committee for adequate funding for the Bike Plan. Martin Koob’s Bike Toronto website chronicles the political and bureaucratic progress of cycling in Toronto, while blogs like Martin Reis’ Bike Lane Diary and Darren Stehr’s Toronto Cranks keep riders up to date on bike activism and culture, enhanced with original photos and film. I Bike T.O., provides a one-stop shop for discussion forums, news and event listings. And, the newest addition, the Toronto Cyclists Union launched this year (www.bikeunion.to). Back in August 1978, Winona Gallop and the students who had helped her build the waterfront bicycle trail, popped the cork on a bottle of champagne to celebrate the end of a nearly ten-year fight to create a dedicated route for cyclists. Politicians spoke, reporters took notes and cameras flashed, but just out of sight a 100 metre stretch of the path lay blocked with abandoned car parts. Even in decay, cars were preventing cyclists from riding the length of the newly christened trail. 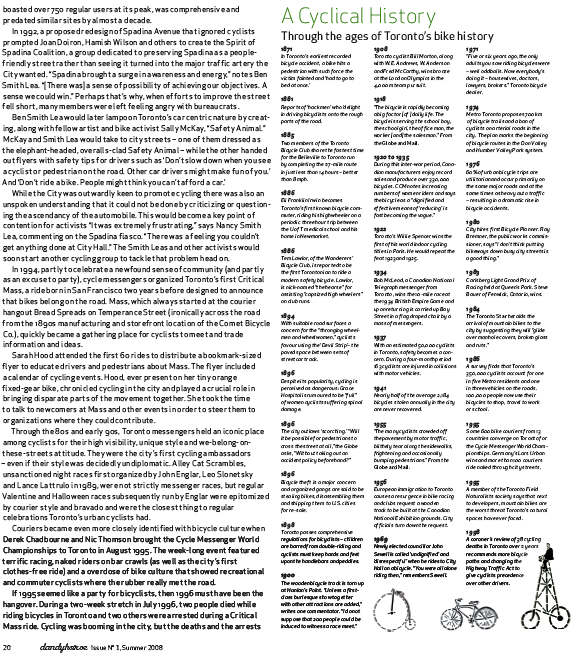 Three decades ago, the automobile was the greatest single barrier to increasing the number of cyclists in Toronto. “[Riding a bicycle] wasn’t respectable for adults and it wasn’t safe for children,” reflects Gallop. “That started to change when the [bike path] went in. It encouraged everyone.” Though much has changed – today there are more cyclists, there is official recognition we belong on the streets and legislation and policies make it easier to hop on the saddle – the car still remains the biggest obstacle to cycling. However, thanks to the many activists who have worked on our behalf there is hope, hope that perhaps in another 30 years, it will be the dense passage of bicycles in our city that delays automobiles – not the other way around. Steve Brearton is a Toronto-based writer, researcher and cycling advocate who curated From Scorchers to Alley Cat Scrambles: The Amazing History of the Bicycle in Toronto at the Market Gallery in 2006. When he’s not riding, he’s walking.